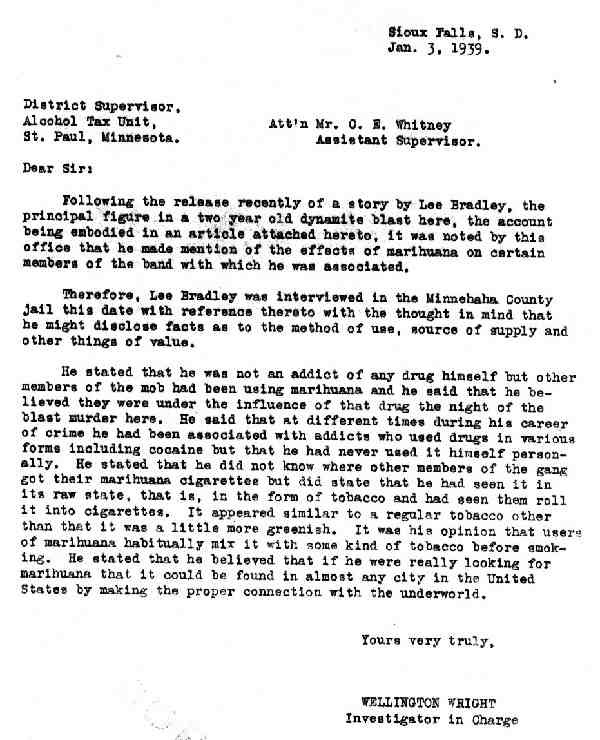 Following the release recently of a story by Lee Bradley, the principal figure in a two year old dynamite blast here, the account being embodied in an article attached hereto, it was noted by this office that he made mention of the effects of marihuana on certain members of the band with which he was associated. Therefore, Lee Bradley was interviewed in the Minnehaba County jail this date with reference thereto with the thought in mind that he might disclose facts as to the method of use, source of supply and other things of value. He stated that he was not an addict of any drug himself but other members of the mob had been using marihuana and he said that he believed they were under the influence of that drug the night of the blast murder here. He said that at different times during his career of crime he had been associated with addicts who used drugs in various forms including cocaine but that he had never used it himself personally. He stated that he did not know where other members of the gang got their marihuana cigarettes but did state that he had seen it in its raw state, that is, in the form of tobacco and had seen them roll it into cigarettes. It appeared similar to a regular tobacco other than that it was a little more greenish. It was his opinion that users of marihuana habitually mix it with some kind of tobacco before smoking. He stated that he believed that if he were really looking for marihuana that it could be found in almost any city in the United States by making the proper connection with the underworld. Enclosed is an Associated Press dispatch carried in the December 29, 1938, edition of the Washington Evening Star, quoting parts of a confession by Lee Bradley wherein he alleges that his four comp ions in the "Powderhouse" slaying in Sioux Falls, South Dakota, on December 31, 1936, were under the influence of marihuana at the time the crimes were committed. With the return of the enclosed clipping, you will please submit a detailed report of any part which marihuana might have played in the murder of Floyd Parker, the attempted murder of Helen Sieler and the related blasting of seven tons of dynamite which had been exploded by Bradley and his companions in an attempt to destroy the bodies which they had thrown into the powderhouse. At the time of the blast murders in Sioux Falls, South Dakota two years ago on New Year’s Eve, I was an Agent of the South Dakota Bureau of Investigation and was assigned to that case. I worked mostly with Claude Bledso and Everett Smith, two Detectives on the Sioux City Police Department, also we were assisted by Lao Naughten, Chief Deputy Sheriff of Sioux City, Iowa. 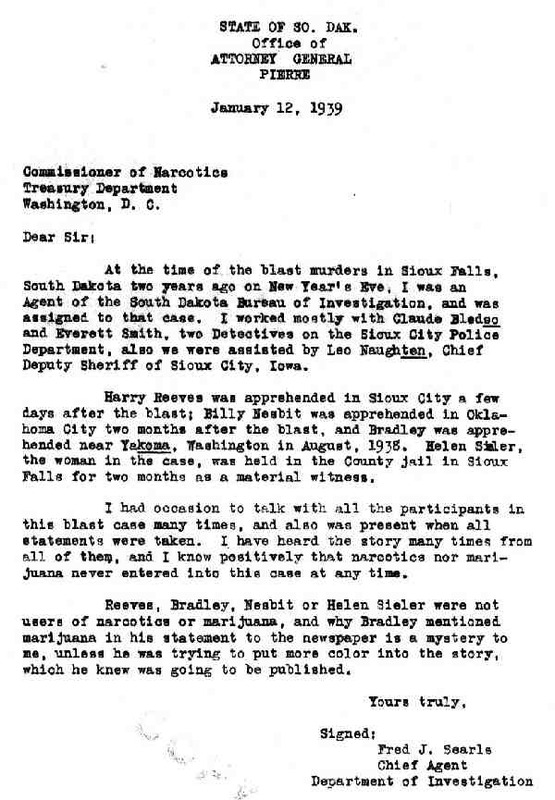 Harry Reeves was apprehended in Sioux City a few days after the blast; Billy Nesbit was apprehended in Oklahoma City two months after the blast, and Bradley was apprehended near Yakoma, Washington in August, 1938. Helen Siler, the woman in the case, was held in the County jail in Sioux Falls for two months as a material witness. I had occasion to talk with all the participants in this blast case many times, and also was present when all statement were taken. I have heard the story many times from all of them, and I know positively that narcotics nor marijuana never entered into this case at any time. Reeves, Bradley, Nesbit or Helen Sieler were not users of narcotics or marijuana, and why Bradley mentioned marijuana in his statement to the newspaper is a mystery to me, unless he was trying to put more color into the story, which he knew was going to be published. I wish to advise that I assisted in the investigation of the blast murders in Sioux Falls, S. Dak. about two years ago. At no time during my association or contacts with the defendant in this case, did I hear them mention anything about narcotics or Marijuana, and I am sure that none of them were users of these drugs. 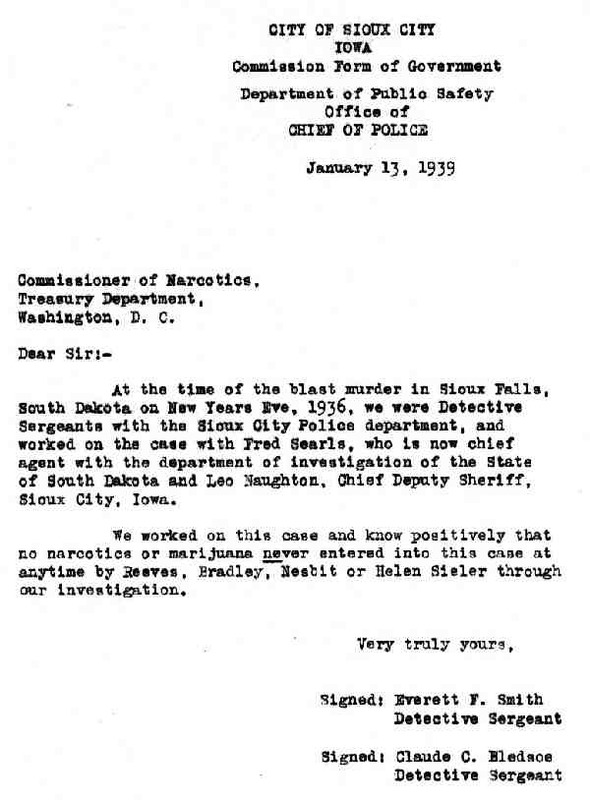 At the time of the blast murder in Sioux Falls, South Dakota on New Years Eve, 1936, we were Detective Sergeants with the Sioux City Police department, and worked on the ease with Fred Searls, who is now chief agent with the department of investigation of the State of South Dakota and Leo Nauehton, Chief Deputy Sheriff, Sioux City, Iowa. We worked on this case and know positively that no narcotics or marijuana never entered into this case at anytime by Reeves, Bradley, Neabit or Helen Sieler through our investigation. 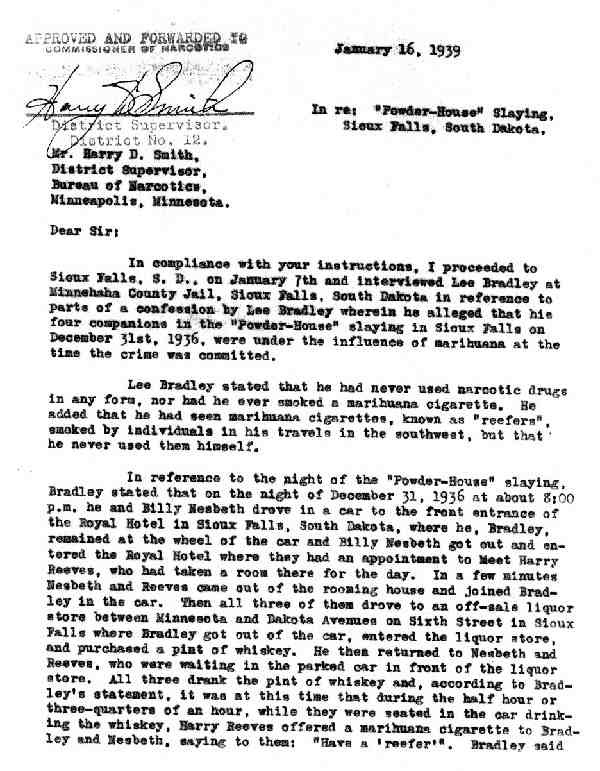 In compliance with your Instructions, I proceeded to Sioux Falls, S. D., on January 7th and interviewed Lee Bradley at Minnehsha County Jail, Sioux Falls, South Dakota in reference to parts of a confession by Lee Bradley wherein he alleged that his four companions in the Powder-House" along in Sioux Falls on December 31st, 1936, were under the influence of marihuana at the time the crime was committed. Lee Bradley stated that he had never used narcotic drugs in any form, nor had he ever smoked, a marihuana cigarette. He added that he had seen marihuana cigarettes, known as "reefer smoked by individuals in his travels in the southwest, but that' he never used them himself. he did not SEE ANY MARIHUANA ICGARETTES, AND WAS NOT CERTAIN WHETHER OR NOT Nesbeth or Reeves smoked one, but he judged from the peculiar odor in the car, that they were smoking a marihuana cigarette. 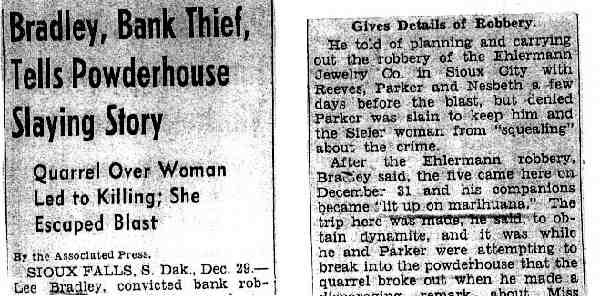 They finally came to the Royal Hotel at 8:45 p.m. or about 9:00 p.m., where they picked up Helen Sieler and Floyd Parker, and all five left in the same car, driven by Lee Bradley to go out to the powder-house on the outskirts of Sioux Falls to steal some dynamite to be used on a safe-blowing job that they had planned on pulling in Minneesota that night. The original plans were for Bradley, Neeboth, Reeves and Parker to on the safe-blowing job, and Helen Sieler was to be left at a farm house along the road. Bradley also said that the only references made to marihuana cigarettes were those mentioned above, when they were in the car in front of the liquor store, and again at the time when all of them were driving to the powder-house when he called his companions "hop-heads” because they were making a lot of noise and because there was a peculiar smell in the car he believed might have been from marihuana cigarettes. This was all the information Bradley could give in reference to marihuana cigarette smoking on the night of the powder-house slaying. He stated, however, that he had seen Floyd Parker smoke marihuana cigarettes on a few occasions some time prior to their coming to Sioux Falls at Butte, Montana. ------------------------ William Nesbeth was interviewed at the South Dakota State Penitentiary, where he is confined under a life sentence for the powder-house slaying. ------------------------ Helen Sieler was interviewed at her home where she resides with her husband, Mr. Hutchinion, at 1102-West 10th street, Sioux Falls, Sought Daketa, and she stated that she had never used any narcotic drugs or smoked marihuana cigarettes, nor had she ever seen Bradley, Nesbeth, Parker or Reeves, smoke any marihuana cigarettes on the night of the crime or at any other time. She added, however, that at times Harry Reeves appeared nervous and it was her opinion that he might have he might have smoked a marihuana cigarette once in awhile. She corroborated the statement of Nesbeth in reference to the pint bottles of whiskey in the car on that night of the crime and said that all members drank some whiskey before going out to the powder plant. Interviewed Mrs. Hannah Brown, 1320 Worth Minnesota Ave., Sioux Falls, South Dakota, the owner of a rooming house at this address, who informed as that Helen Sieler and her husband had a room in her house for ten weeks between October and December, 1938. Just before Christmas she was compelled to force them to leave because of Helen Sieler’s heavy drinking. She said she had no reason to believe that Helen Sieler was a drug addict or that she was under the influence of marihuana at any time. ------------------------ Harry Reeves was interviewed at Fort Madison State Penitentiary at Fort Madison. Iowa, and he stated that he had known Bradley since 1924, Nesboth several years, but that he had only known Parker and Sieler for three days prior to the day of the explosions at Sioux Falls. He said he was not a drug addict of any kind. had not smoked a marihuana cigarette, had not seen marihuana at any time, and he had no reason to believe that his companions were smoking marihuana cigarettes at any time. He also said that Bradley's statement, that he, Bradley, was offered a marihuana cigarette by Reeves while they were in the car waiting In front of the liquor store, was untrue and that he, Reeves, did not have any marihuana cigarettes at y time. ------------------------ Clinical records in the Minnehaha County Jail were examined but nothing found that would indicate that any of the powder-house game were addicted to narcotic drugs or marihuana cigarette smoking. I visited the Minnehahn County Court House, where I looked over the transcript of the case: "Circuit Court, Minnehaha County, Second Judicial District, State of South Dakota. The State of South Dakota VS - Lee Bradley, alias Tom Tobin, William Nesbeth and Harry Reeves, alias "Slim." to any kind of narcotic drug or me" However, there is some mention made of drinking whiskey and whiskey bottles being in the car on the night of the powder-house slaying. I also Interviewed the clerk of the court, Mr. Eugene Foster, who was in charge of the records in the court room at the time of the trial, and he said that no of the trial, and he said that to mention was made by either the defense or prosecution as to the use of narcotic drugs or the smoking of marihuana cigarettes by any of the defendants herein mentioned. In the course of my Interview with Bradley, he said that only a few days ago he was interviewed by a Mr. Wright of the Alcohol tax Unit of Sioux Falls, South Dakota in reference to his use of drugs or marihuana cigarettes. I therefore contacted Mr. Wellington Wright, Investigator in Charged of the Alcohol Tax Unit at Sioux Falls, South Dakota, who gave me a copy of his report, submitted to his District Supervisor, attached herewith which is self-explanatory. I have subsequently also interviewed Mr. Fred J. Searls of the Attorney General’s Office of the State of South Dakota. Mr. Searle had opportunity to interview the members of this gang, and his statement, which in self-explanatory, is attached herewith. Also attached herewith are statements made by detectives Smith and Bledsoe of Sioux City, Iowa, and by Naughton, Deputy Sheriff of Woodbury County, Sioux City, Iowa, who had worked on the case and had opportunity to interview the defendants at different times. My opinion is, from my interviews with the prisoners, Helen Sieler, and officials who worked on the case and had personal contact with them, that none of the participants in the crime were under the influence of marl cigarettes. In r: “Powder-House” Slaying Case, Sioux Falls, south Dakota. 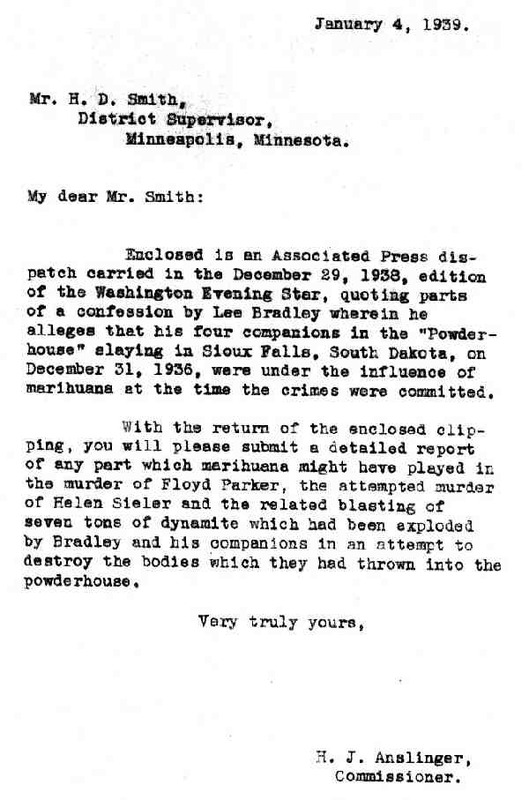 Please refer to your letter of January 4, 1939 with which was enclosed an Associated Press dispatch of December 29, 1938 taken from the Washington Evening Star, quoting parts of a confession by Leo Bradley wherein he alleges that his four companions in the “Powder-House” Slaying in Sioux Falls, South Dakota on December 31. 1936 wee under the influence of marihuana at the time the crimes were committed. 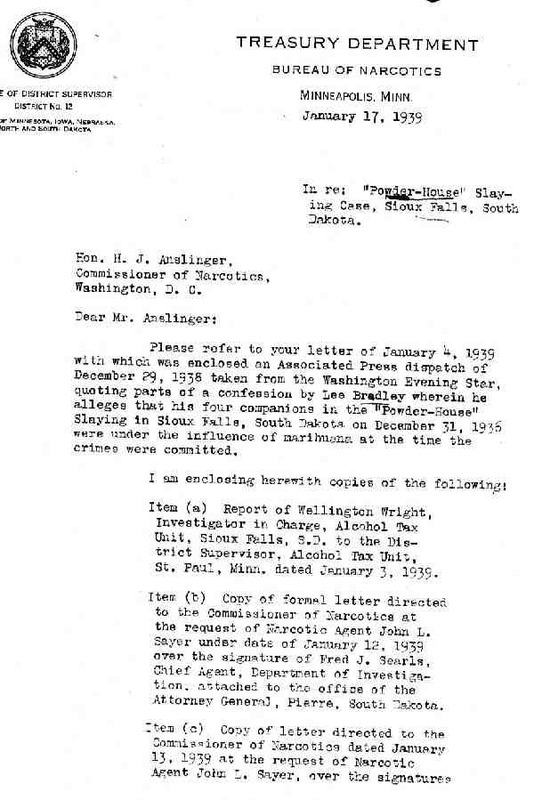 Item (a) Report of Wellington Wright, Investigator in charge, Alcohol Tax Unit, Sioux Falls, S.D. to the District Supervisor, Alcohol Tax Unit, St. Paul, Minn. Date January 3, 1939. 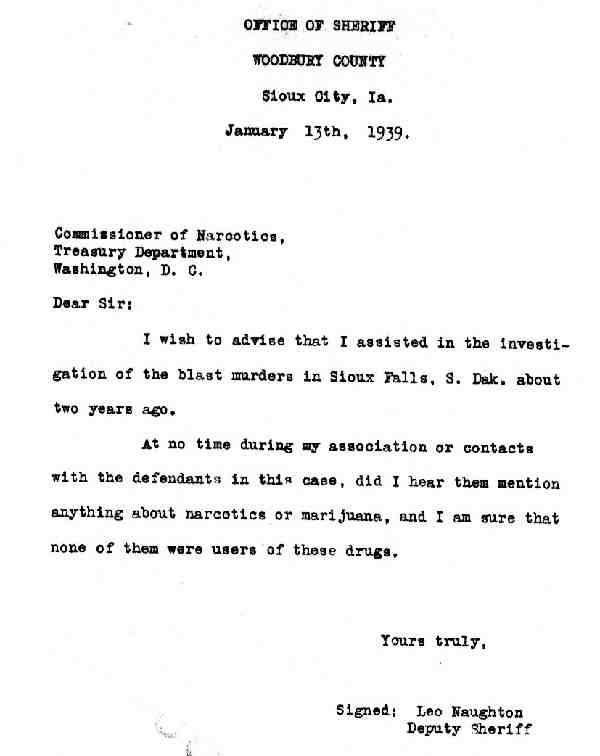 Item (b) Copy of formal letter directed to the commissioner of Narcotics at the request of narcotic Agent John L. Sayer under date of January 12, 1939 over the signature of Fred J. Searls, Chief Agent, Department of Investigation, attached to the office of the Attorney General, Pierre, South Dakota. Of Everett F. Smith and Claude C. Bledsoe, Detective Sergeants, Sioux City, Iowa. Item (d) Copy of letter dated January 13, 1939 directed to the Commissioner of Narcotics at the request of Narcotic Agent John L. Sayer over the signature of Leo Naughton, Deputy Sheriff, Sioux City, Iowa. 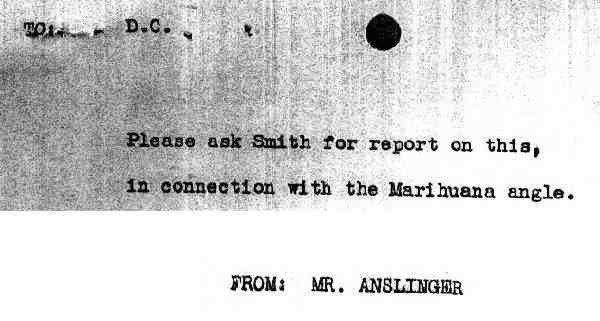 Item (e) Copy of report submitted by Narcotic Agent John L. Layer covering the entire subject, as instructed by your communication of January 4, 1939. I am also enclosing the clippings which were enclosed with your letter which, it was instructed, were to be returned with this report. In my opinion Narcotic Agent Sayer has indeed made a thorough and complete investigation of this matter, and I believe you will agree that there is no justification for the allegation of narcotic addiction, regardless of newspaper accounts. The matter is therefore submitted fro your files and reference. Please ask Smith for report on this, in connection with Marihuana angle.